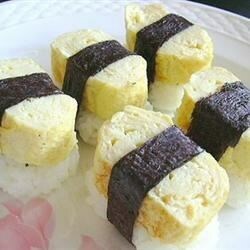 "Tamago egg is classic Japanese folded omelet sometimes called tamagoyaki. The omelet is sweet, has a light texture, and works well when served over sushi rice and with soy and wasabi sauce for dipping. Tamago is the Japanese word for egg. Mirin is sweet rice wine and dashi is traditional Japanese soup stock (make from kelp or shiitake). These ingredients are now carried in most larger grocery stores or at Asian markets." Beat eggs thoroughly in a bowl; whisk in dashi stock, sugar, mirin, and soy sauce until sugar has dissolved. Place a nonstick skillet or omelet pan over medium heat. Oil the pan with vegetable oil. Pour a thin layer of egg mixture into the hot pan and swirl to coat pan. When egg layer is firm on the bottom but still slightly liquid on top, lift up about 1 inch of the edge of the omelet with a spatula and fold end over remaining egg layer; continue rolling the omelet to the end and push the roll to the edge of the skillet. Oil the skillet again if it looks dry; pour another thin layer of egg into the skillet and lift the roll to let the egg flow underneath the omelet roll. Fold the omelet roll over the new layer of egg, continuing to roll to the end as before. Push omelet to edge of skillet. Pour a new egg layer into the skillet, oiling the pan if needed. Roll the omelet over to incorporate the next egg layer into the roll. Pour new layers and roll into the omelet until all egg mixture has been used. Remove omelet to a serving platter and cut into 6 equal pieces to serve. A foolproof method for perfect hard boiled eggs, every time. It is best to use a Tamago pan, which is a 5x7-inch square nonstick frying pan, but any small pan will work--you just won't have square ends on your finished omelet-- but no effect on taste. Good stuff. I personally feel that wrapping the slices with nori (seaweed used for onigiri) makes it taste better. Good recipe. Had to substitute a milder fish sauce for the dashi stock, because I was out. oh no! but the recipe tasted good otherwise. Great alternative for my kids lunches! they loved it and now request them weekly! Originally I was going to save some but I loved it so much I ate it while it was still hot! EXCELLENT recipe! Thank you so much! This was so delicious and I'm going to make this again.